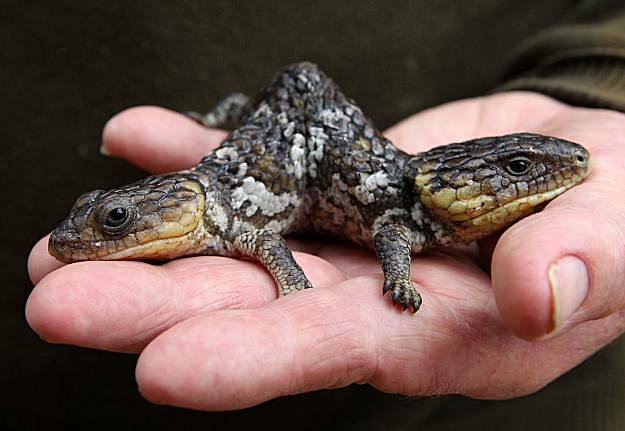 Two heads are not necessarily better than one: A double-headed bobtail lizard born in Perth, Australia, has problems crawling because its hindlegs get conflicting signals from each brain. Also the bigger head keeps trying to eat the smaller one. Update: By the way... "Bicephalous"? "Dicephalous?" Sources I've consulted seem to accept both, and if anything accept the former as more common, but the latter seems more consistent in its use of a Greek prefix. Thoughts, my little wordbugs?